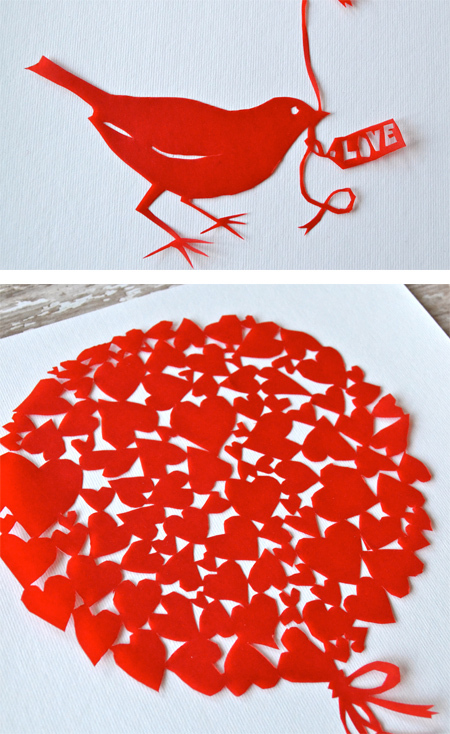 I absolutely love the art of paper cutting (Scherenschnitte). There are many true artists out there that create amazing, intricate work. I took a class on that topic a couple of years ago and have been trying my hand at it now and again ever since. Because I'm not much of an artist and because I'm such an amateur at paper cutting, I shamelessly stole a beautiful paper cut pattern from the internet (here. Wish I had a true photo credit for it.) and then simplified it a little so that I could actually make it work for me. I added some of my own touches as well. 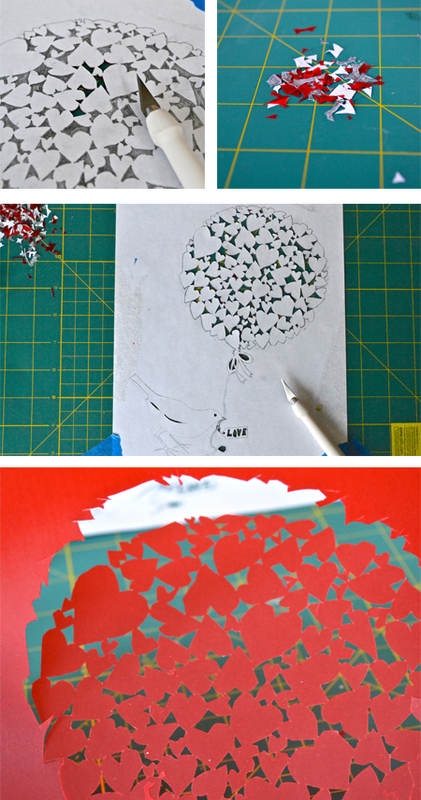 Here's a few tips I picked up in my class if you'd like to dabble a little in paper cutting yourself. First, you'll need a pattern to work from. (at least I do) I sketched my pattern onto a piece of printer paper. Then you'll need a nice sheet of paper to cut the pattern onto. I decided to go with a sheet of red vellum. I figured that it isn't the easiest to tear, but it is still relatively thin. Whatever paper you choose, make sure that it is the same color all the way through. Start cutting the small details on the interior of your pattern. You'll want the excess paper, it makes everything more stable. Go slowly and make small cuts. Once you are done with the small details, move onto the bigger details and then cut the main outline. As you can see, my cuts are far from perfect, but oh is it satisfying seeing the end result of your hard work. It's almost magical when you carefully separate the paper cut from the outside paper. One last note: Remember to cut the paper and not yourself. That's always good advice. You definitely should! I'm so glad that I gave you a nudge. I love doing this kind of work. One year I made many Christmas oriented cutouts and put them between pieces of glass - one colored and the other clear. My husband works with stained glass and had the materials to tape and solder them into hanging ornaments. They're always well-received. What a great idea! I'm totally making ornaments out of my paper cuts this year. This is so fabulous! 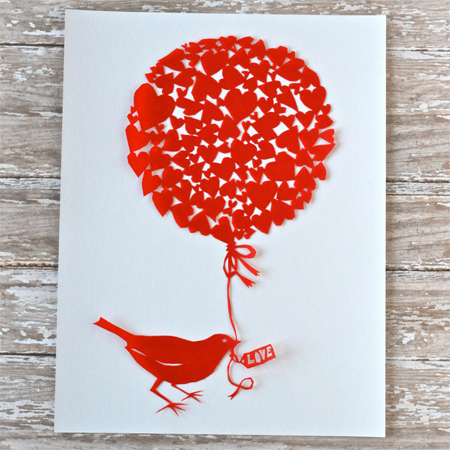 You've inspired me to do some paper cutting! I'm so glad! It can be time consuming, but I find the end result so rewarding. Thanks for dropping by. It did take some effort to cut out all of the tiny details, but no more than a few nap times in our house. I went ahead and framed it, it makes me happy every time I look at it. Thanks for dropping by! Thank you so much! Thanks for dropping by. Hi- Not too late at all. I actually just laid the pattern over the red vellum and then taped all four corners down to my cutting mat. I didn't experience any slippage of the red sheet, but for extra security, you could tape it down to the cutting mat as well. Remember to do all of the small inside details first. 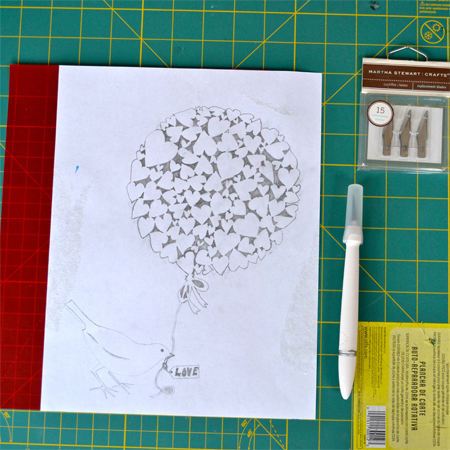 I found that, working from the inside out, the two sheets of paper tend to bind together a bit while I am cutting. 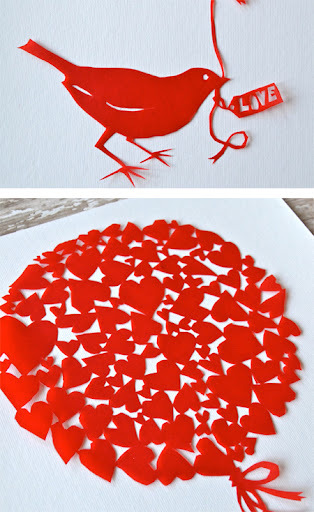 really a easy way to cut with your own style and show your feelings to your loving one.